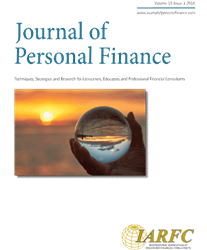 The first issue for 2016 of the Journal of Personal Finance is now available from the International Association of Registered Financial Consultants (IARFC). This practitioner oriented distinctive publication promotes research to examine the impact of financial issues on households as well as research on the practice and profession of financial planning. Having spent the last 40 years of my career trying to convince editors to publish my articles, it is a real pleasure to switch over to the role of being a co-editor... Walt Woerheide, Ph.D.
Six articles are included in Volume 15, Issue 1. Topics explored are America’s Retirement Income Planning Literacy; Reverse Mortgages, Annuities and Investments; Roth Conversion and the Financial Consequences of IRA to Roth IRA Conversion; Tax Refunds to Debt Reduction; and Measuring Risk Tolerance. Contributors to this edition include: Jamie Hopkins, JD, MBA, LLM, CLU®, RICP®; David A. Littell, J.D., ChFC®; Joseph Tomlinson, FSA, CFPTM; Shaun Pfeiffer, Ph.D., CFPTM; John Salter, Ph.D., CFPTM, AIFA®; V. Sivarama Krishnan; Julie Cumbie; James S. Welch, Jr.; Norma B. Coe; Timothy Clegg; Michael S. Finke; and Michael A. Guillemette. Co-editor Wade Pfau, Ph.D., CFA, RFC® is a Professor of Retirement Income in the new Ph.D. program for Financial and Retirement Planning at The American College in Bryn Mawr, PA. Walt Woerheide, Ph.D. ChFC®, CFPTM, RFC®, has been at the American College for 14 years and served as VP of Academics and Dean for 12 of those years. This will be his first issue as co-editor for the Journal. The Journal of Personal Finance is a member benefit of the IARFC. To order a hard copy or electronic version of the Journal, to find out more information or to review article submission guidelines, go to http://www.journalofpersonalfinance.com or contact the editors.